Carrots and balsamic = Easiest. 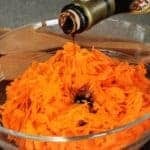 Carrot Salad. Ever. Summer produce has hit full stride. I’ve got peaches, watermelon, cherries, herbs, snap peas, and carrots waiting to be eaten. So the The Recipe Redux challenge of celebrating the fruits and vegetables we’re eating and, if we’re lucky, growing, is on target. More specifically, how we use gadgets to create inspired shapes. Hmmm…wonder if a rectangle counts? I’m old school in the gadget department. No spiralizing here, instead I use a chef’s knife, food processor or box shredder. 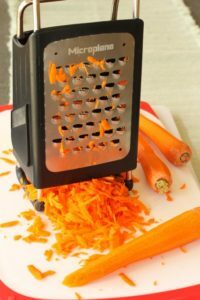 I like this Microplane grater. It’s sharp, sturdy, quick and easy. Just what I want. 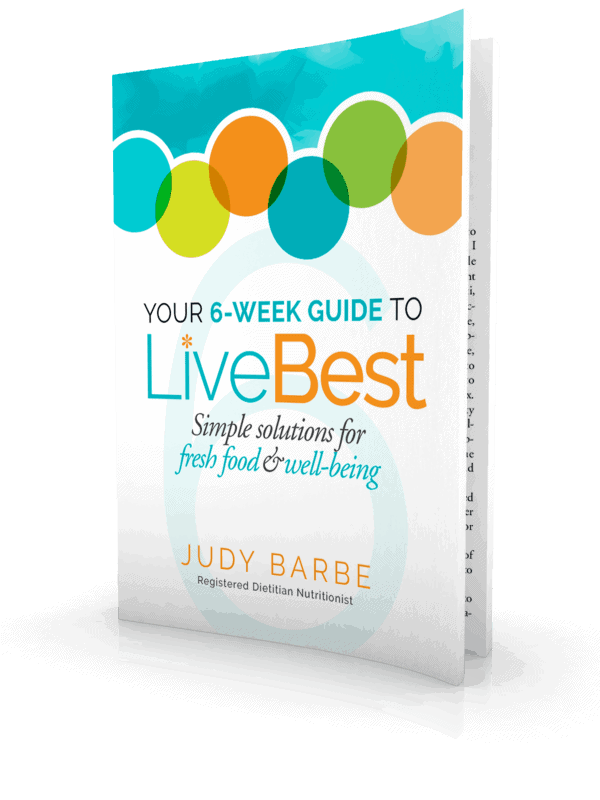 One of the tenants of my book Your 6-Week Guide to LiveBest is feeding your soul. 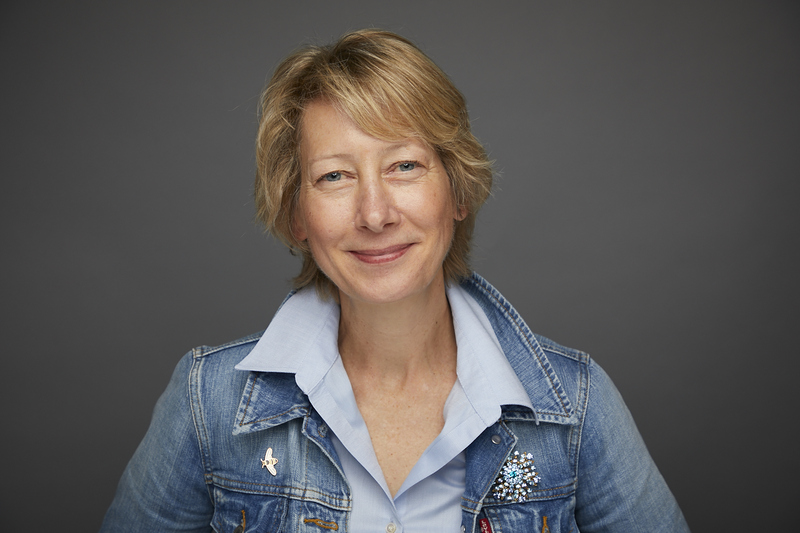 Imagine how fortunate I feel to incorporate so much soul food into a single blog post! Eating is near the top of my what-makes-me-happy list. I’m not much of a gardner, but I do like to eat food I’ve grown. Thankfully, carrots were a successful crop. As you sow and reap, you find there is no such thing as an ugly vegetable! Food draws me on my travels. Travel is where I spend time and money. Though I’ve been to nearly all 50 states and more than 26 countries, I still have lots to see and taste. I’ve been described as a sponge…having insatiable curiosity. Food production is one area I love to learn about. Seeing balsamic vinegar production first hand in Italy made that trip even sweeter. Literally. You might think of vinegar as sour, but balsamic has a unique sweetness. Balsamic originated in the Italian province of Emilia-Romagna and continues to be a rich part of the the culture. 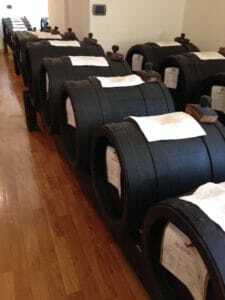 Today you can find traditionally and commercially produced balsamic, as well as lots of imitations. Balsamic bottled in Italy is labeled with API MO or API RE, for Modena or Reggio. Traditional Balsamic Vinegar of Modena (Aceto Balsamico Tradizionale di Modena) is just that. Traditional. For more than four centuries, balsamic continues to be based on 4 components. Climate. Hot summers and cold winters, humidity helps. Grapes. Lambrusco and Trebbiano are traditionally used. The pressed juice or “must” is simmered to a concentrate before being stored in wood barrels. Wood barrels. Oak (adds a vanilla flavor), mulberry (enhances the concentration), chestnut (contributes to the color), cherry (adds sweetness) and juniper (contributes spiciness). The barrels are stored where natural temperature fluctuation and fermentation happens – such as a barn or attic. Summer heat and cold winters cause the barrels to expand and contract. This movement allows the vinegar to take on the flavors of the wood. As the liquid evaports and concentrates it is moved into another barrel, a smaller one. This stair-step barrel change happens three to five times. Time. Traditional balsamic is aged a minimum of 12 years. After twelve years, the vinegar undergoes rigorous tasting by a special taster commission. If all goes according to plan, the balsamic is approved by the commission and earns it’s place in the uniquely-designed bottle specified by law and labeled with a red seal. Giuseppe Giusti and Acetaia Malpighi are the Modena, Italy balsamic tasting rooms I visited and both sell products in the states: Giuseppe Giusti and Malpighi. Commercially prepared vinegars are readily available. They vary by brand and cost is no indication of taste. Because this aged vinegar is so precious (with price to match), it is considered a “special sauce” to be drizzled over roasted meats, fresh fruit, ice cream, and vegetables. It is also sipped as a liqueur. On a trip to Italy, in a tiny, 8-table restaurant, I enjoyed carrots that were as delicious as they were simple. 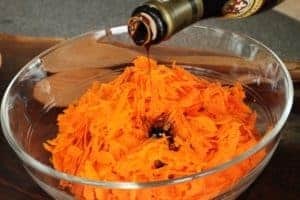 Shredded carrots and aged balsamic. That’s it. And that’s what summer cooking is about – enjoying the lovely favor of ripe, seasonal food. 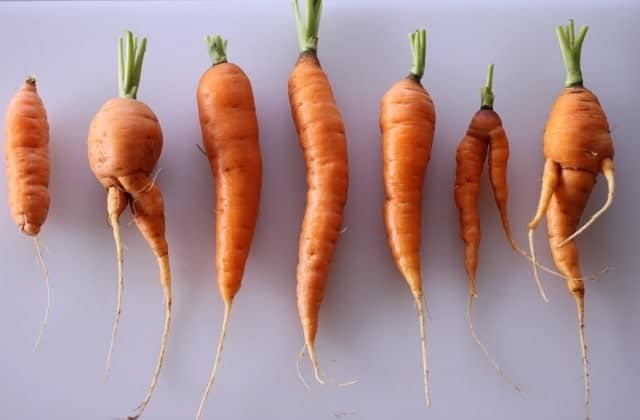 When you grow your own carrots, there’s no such thing as an ugly one. When you drizzle them with balsamic, there are no leftovers! P.S. Want more LiveBest travel tips? Check ’em out here. Delish, nutrish recipes? Sign up for my newsletter right here. 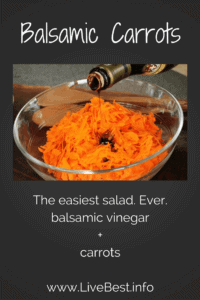 Carrots and balsamic vinegar = the easiest salad ever! Drizzle vinegar over carrots. Stir. Check out all the foods my fellow Recipe Redux food bloggers are enjoying this summer. Yum! I love carrots and this looks like a great and simple way to serve them! Thanks, Courtney. Sometimes simple can be best! Let me know how you like them.